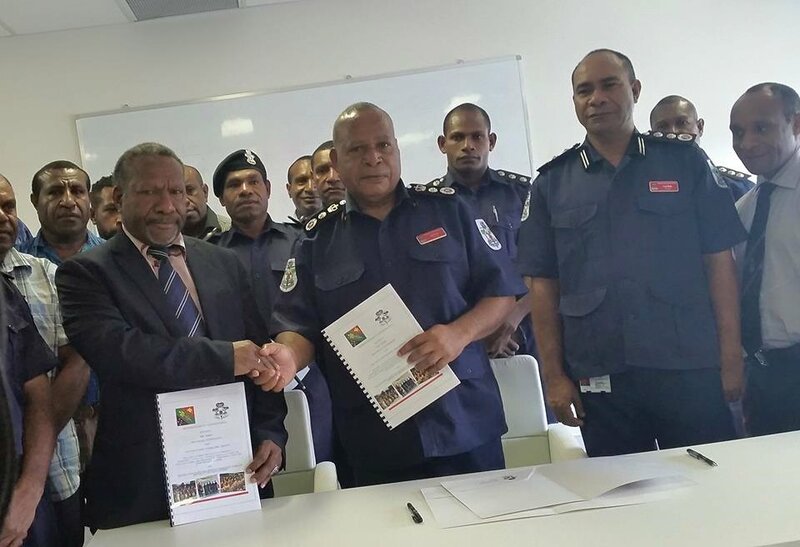 PNG Fire Service and the Simbu Provincial Government signed an MOU today which paves way for the establishment of a Fire Service in Kundiawa, Simbu Province. The signing was witnessed by delegates from the Simbu Provincial Government, Fire Service Personnel and the media. Chief Fire Officer Bill Roo said Simbu Governor Michael Dua’s gesture in establishing a Fire service in the province, is a move he deeply honours. “There is a growth in the building industry within the cities and towns throughout the country thus; the responsibility to protect the building assets and the lives of the occupants from Fire disasters is truly a mammoth task for the Fire Service,” said Chief Fire Officer Mr Bill Roo. Mr. Roo during the signing of the MOU also announced that Inspector Simon Kiom for Kundiawa under the existing structure will uphold all the relevant roles and responsibilities of the Fire Services in Simbu. Simbu Governor Mr. Dua said, Simbu Province has being missing out on many services for many years and fire service is one of the many. Changes are happening in Kundiawa town, good houses, new buildings and business houses are been erected. Changes are good but all this assets need to be protected and the worst that can happen o them is to watch them go up in flame helplessly. Governor Dua said, one sacrifices over the years was to produce such outcome and Simbu Provincial Government must do something to protect its Province’s assets. “The Simbu Provincial Government is happy to sign the Memorandum of Understanding with Fire Services to protect Kundiawa town”, said Simbu Governor Hon. Dua.